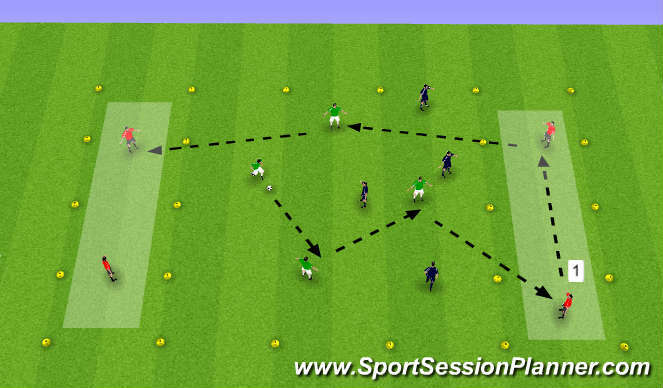 The purpose of this practice is to encourage players to work together and pass the ball between themselves whilst moving around the area and retaining possession. With the use of different passing techniques, distances, body shape, pace of the pass and runs on/off the ball. Ideal for any age. The setup of this practise is with 3 teams of 4 players each in different coloured bibs, each team has a ball. 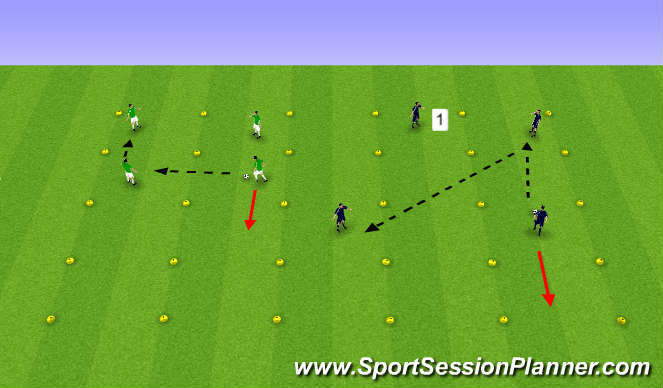 First start the practise with each player looking to play to a team mate who must be in a different square. 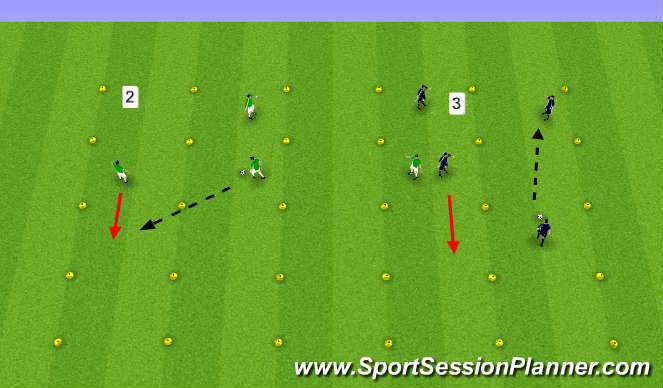 Once the player has passed the ball they should look to move into a different square in the area. Can the ball see you ? Players can now pass the ball but it must travel across an empty square. Good communications is key! Encourage different methods, verbally, hand signals, eyes, body shape. Ensure the weight of the pass is correct and timing of the player running onto the ball. Players can now pass the ball around freely between team mates. However if an opposing player enters the same square they cannot receive the ball but must look to find an empty square (free space). The team mate with the ball has to make the decision to pass to this player or find someone else. Teams look to identify the best pass (short, long, lofted) directly to their team mate, in front or into space. Now remove the central cones and have 2 targets areas. One of the teams can occupy the team areas at each end. The other two teams are placed in the middle. Target player plays the ball out to one of the teams. The opposing team has to try and steal the ball and retain posession and they too get a point by playing into a target player. If the ball is received by a target player the target player delivers the ball to the opposing side. Give each team equal amounts of time and ensure all the teams have a chance to be target players. Before - you get the ball what are you going to do? When - you have the ball what are you going to do? Do you know you next pass or move? After - after you passed the ball what are you going to do ? Are you going to support your team mate? Are you going to find space again? Now the target players can pass the ball back to the same team who delivered it too them. If the team can retain possession and get it back to the other end they earn 3 points instead of 1.